Learn some of Viktor's favourite crowd-pleasing moves! This Sydney workshop was recorded so that you can learn from this great, world-champion dancer. Learn the style everybody wants to copy. We are very pleased to be able to offer you the extremely talented UK dancer, Viktor Andeke in action. Viktor is one of the most impressive and best Cerocers in the world, and has won countless championships on both sides of the world. This DVD was recorded at a workshop in Sydney, Australia, targeted at Intermediate to Advanced dancers. Although the cover features Carol Haines, Viktor is partnered in this workshop by the amazing Lydia Maurer. PLUS... variations, style tips and great demos! Learn some of Viktor Andeke's very stylish Freestyle Moves. Although the cover features Carol Haines, Viktor is partnered in this workshop by Melissa. 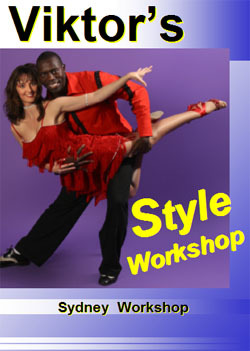 A magical style workshop from Viktor & Lydia - two of the most stylish dancers you will ever see. Although the cover features Carol Haines, Viktor is partnered in this workshop by the amazing Lydia Maurer, who teaches lots of style points for the ladies. Please note: the Intermediate Class was filmed with an exuberant class of Australians, resulting in quite a lot of background noise!